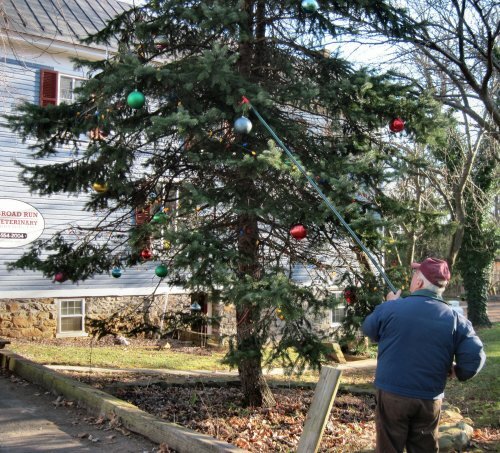 Every early December certain dedicated Bluemonters bring a collection of oversized ornaments, long strings of lights on large wooden spindles, and six-foot boom poles to decorate the full grown tree next to the Bluemont General Store. 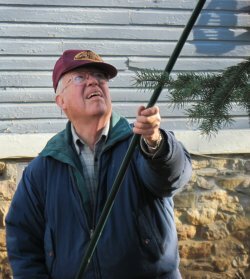 Above, Henry Plaster demonstrates practiced skill with the long-poll outdoor-tree decorator. Henry Plaster closes in. 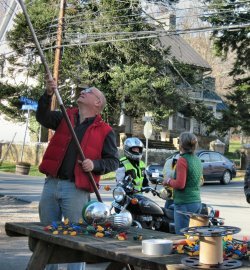 Skip Pettit reaches high. 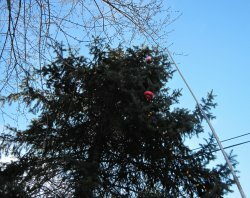 Ornaments reach the top of the tree. Patti Pattit and Tim Hall assess the efforts.